HappyBaby and YoBaby review plus GIVEAWAY! Today is a combined review( and GIVEAWAY!) of HappyBaby and YoBaby products. I was sent coupons to try free products from both companies. YoBaby– I picked up a pack of the apple and blueberry flavored multipack. They were small sized 4 oz yogurts. 3. follow me on twitter/ tweet about this giveaway! 4. for TWO entries, blog about this giveaway! (please leave a comment with the link). Contest Ends FRIDAY, August 20th, 2010 12 PM. Open to US residents only. 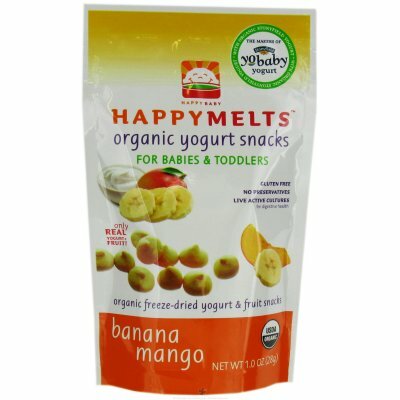 Anyway– HappyBaby has a line, HappyBites, that makes organic meals for toddlers and kids. I was sent a coupon from the company to try a free product in the mail. So, I went to the store, and at the time, I had the choice between “Salmon Stix” and “Veggie Tots” in the freezer section. Hmm.. Veggie Tots sounded much more my style than Salmon Stix. So, Veggie Tots it was! I took my “tot” out of the freezer and overwrap, and put it in the microwave for a bit, and then heated/toasted it in my toaster oven for some crunch. I believe these are geared to be meals for kids or toddlers, but I certainly couldn’t have just that, so I ate it alongside some applesauce, broccoli, and a soy-style “chicken” patty for my meal. Looking at the veggie tot, you can CERTAINLY see it was bursting with veggies. There was visible carrots, onions, black beans and corn, all seemed to be mushed together in a potato-like patty. The taste is predominantly potato, a little dry, but overall had a hash brown/tater tot taste. It wasn’t too salty in flavor, with a very mild cheddar cheese and black pepper flavor. The corn and the black beans were also a bit dry, but not bad. 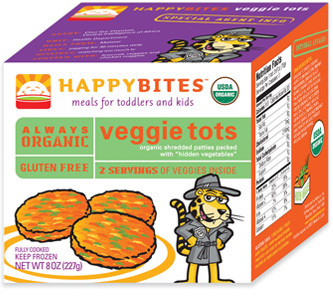 1 Veggie Tot is 110 calories, 3 grams of fat, 18 carbohydrates, 3 grams of fiber, 1 gram of sugar, and 3 grams of protein.